Let’s start this children’s book review with a true confession: I have refused to read this book for several years. I would get as far as reading the first few pages, but reading about a car blowing up because of a monster was too much for me! I felt it was too scary with too much “violence” for tender readers like myself, well past the age of 21 I knew that in the Waldorf curriculum and many other excellent schools, studying Greek mythology is an important part of the fourth and fifth grades. I also knew for a fact most middle school boys love this children’s book series. What allowed me to continue to read past the exploding car was a visit to my ten-year-old grandson, who was now reading the fifth children’s book in this series, and who insisted that it “really, really gets better, and it’s really, really good.” He also added, “And it’s funny…” That did it, and during our reading time together, he read Book V, and I gingerly turned pages in Book I. “Once he starts on his quest, it’s really fun, and it’s not quite as dramatic…” my consultant ten-year-old adds. He was right, of course. It does have an ample amount of humor. It also has an immense amount of solid Greek mythology. And it has non-stop drama. Honestly, it is so compelling, I had to force myself to stop reading from time to time, because I found I was lost in another world. A children’s book that has heroes, villains, lessons, drama, and a good dose of escapism can’t be ignored. 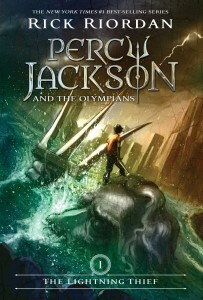 PS: My grandson said if I reviewed this children’s book, it was important to mention that the Percy Jackson movies are nothing like the book at all, and probably not worth watching.